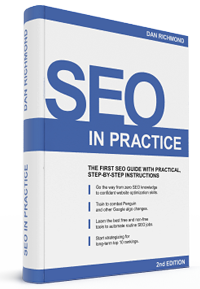 You're about to grab the second 2013 edition of SEO in Practice. It's an updated version where you'll find even more of efficient SEO techniques than in the first book. And I show you ins and outs you need to know of today's Search Engine Optimization. Here's the underlying principle of this book: the main thing of SEO is practice. Yeah, learning SEO makes you smart — but doing SEO drives your site up. With this guide, you'll be learning and doing SEO from the very first minute, and see how exactly you'll take your site to the top of Search Engines, where the sweetest spot is. I've been discovering all tricky web promotion techniques for many years. Several years ago I put them all in the SEO in Practice guide and I'm glad it turned out to be very useful to most readers, just like I hoped. Now I'm glad to offer an updated version which contains even more of valuable information. Don't worry though. Such core features as simplicity, illustrative examples and ease of rendering were left untouched. And believe me, what you'll see is amazing. As soon as you get down to reading, you'll find out how just a few tweaks to your site skyrocket your bottom line — and how you can ensure long-lasting success. So the #1 goal of this whole book is not simply to teach. It's to show you the exact steps that alone will let you jumpstart your website sales — and do that easy, free and fast. Sure, to get going with your own SEO campaign, you don't have to wait till you read the whole book. The sooner you start, the earlier you get the results. So grab the first chapters — and get down to optimizing your website right now. Just like before, I urge you to comment on what you read, discuss the techniques, say what else you'd like to be covered. Post comments or just email me at dan@seoinpractice.com if you want to discuss your own SEO-related questions. Now, is your site ready for the huge popularity that's coming? Grab the first chapter and see!